This year, I've been exploring a ton of new spots around my area, and today was not an exeception. 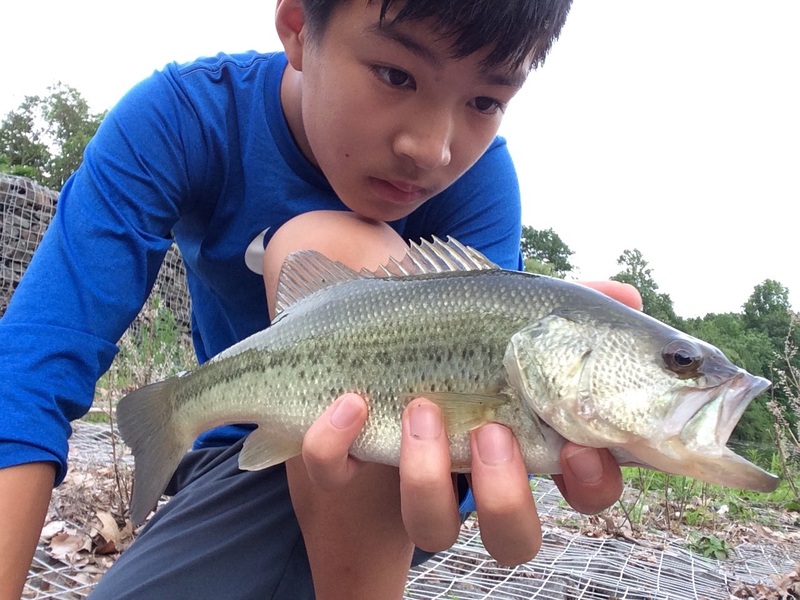 One of my friend's dad had informed me about a potential great bass spot, where he and my friend caught some big largemouths. I thought, why not? and headed over. 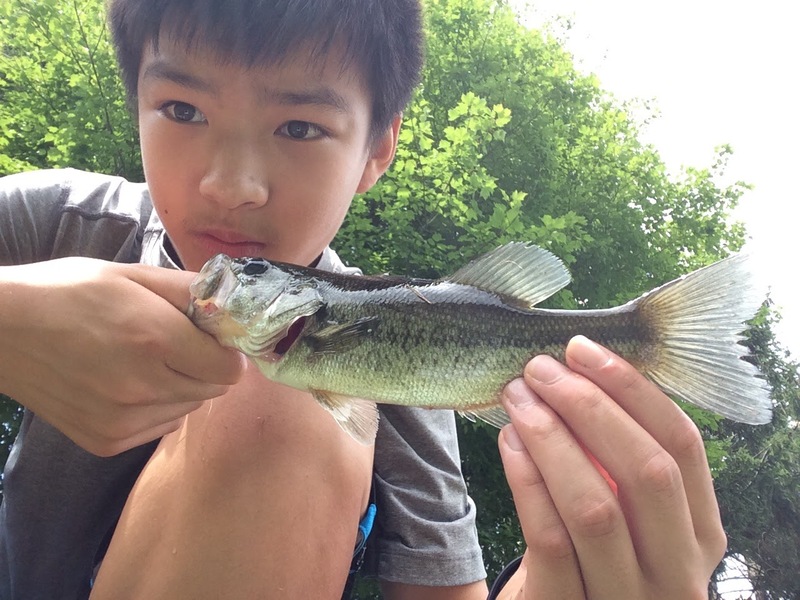 It is actually the same creek that I fish near my home, but it gets much wider over there. At first glance, It looked great. 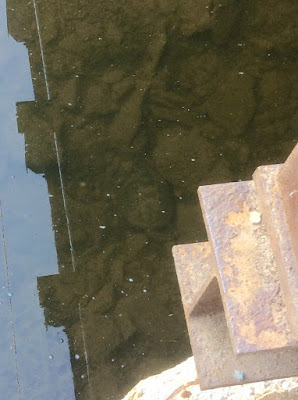 There was a lot of submerged timber, some flats, and deep channels. 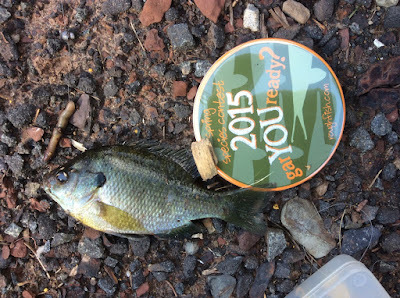 The water was murky from recent rains, and I tossed spinners, plastics, and topwaters to no avail. Then, I saw a gigantic SPLOOOSH near shore. I fired lures near it, but nothing struck. Then I saw them. 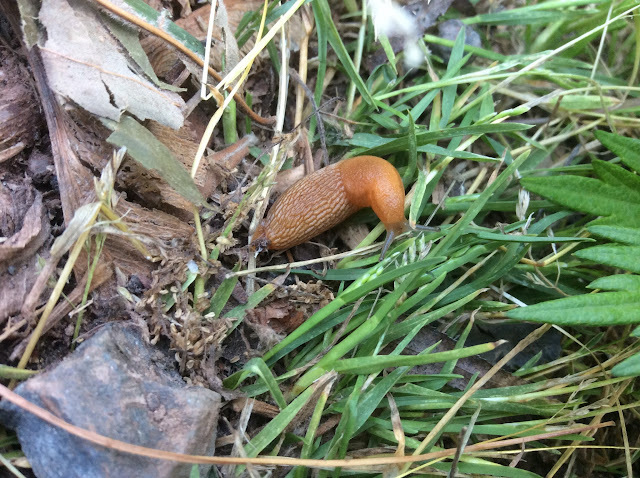 Fat, golden-brown, lazily cruising and making an enormous mess out of the silt bottom. They were grazing in 1-2 feet of water, sometimes less. Their backs were out of the water, fish were tailing, and luckily, I brought corn. After casting some corn, I got a bite in 5 minutes. I had about 2 seconds of a hard, bulldogging run before the hook pulled. Darn it!!!! The Common Carp is a fish I have a particular grudge against. 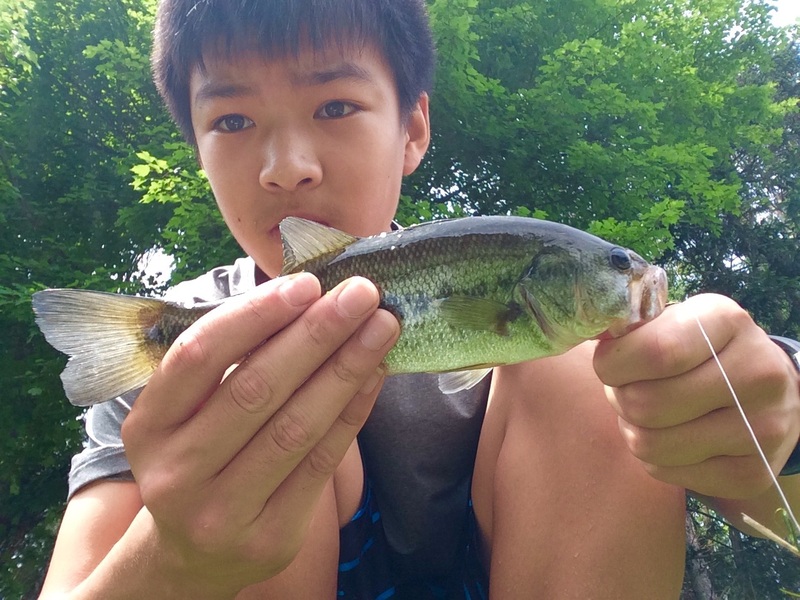 In Minnesota, I hooked 5 20-30 lbers, but all got off in the landing, where I had to lie on my belly and try to grab it with one hand. I was kicking myself for not buying a landing net. Returning to the present...While I was getting back to re-rig my corn, disaster struck, in the form of a landowner. The creek was on the other side of a large fence from some private homes, so I assumed the water wasn't their property. The Landowner said otherwise, that she owned part of the water as well, and I was "damaging her property." She also spoke about liability issues,etc. I gave my apologies and walked away. That was a bummer. 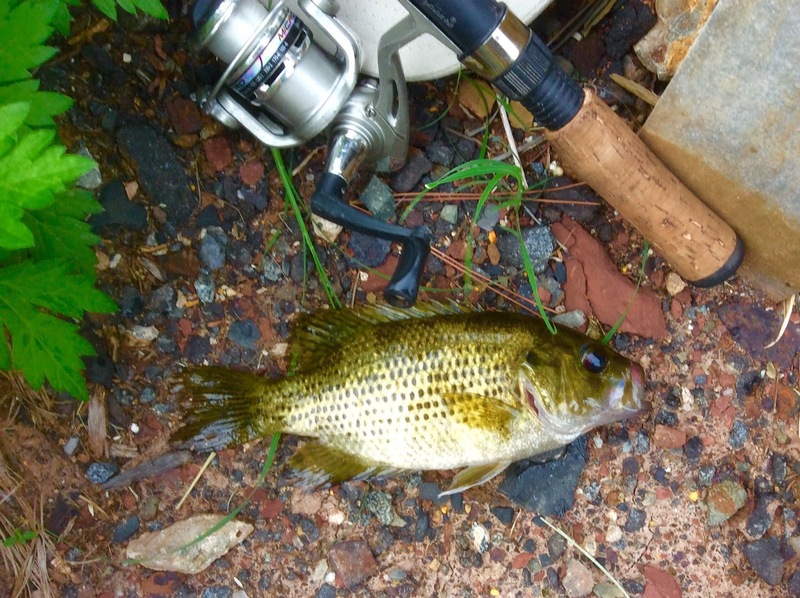 That creek was the first good carp spot I've found, and so close to home, as well. I decided to head to a bridge, a couple hundred yards from where the creek widens up, where the creek was still a very small creek. There I tried to salvage the remainder of my time. I did see some carp though, and failed to catch them. But they were in there, just at far less density and size than the other area. 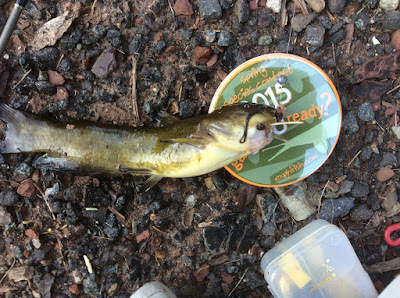 I did, however, find a school of tiny bass that were quite fun on my ultralight,so at least I didn't head home with a skunk. It was both an informative and disappointing outing, but I did find a great new spot... now I just have to find non-private access or ask permission from a landowner. 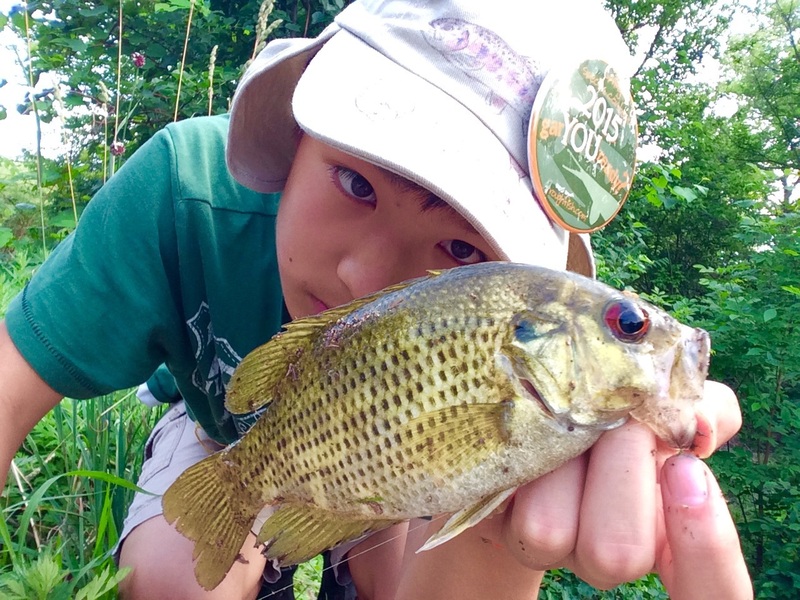 My friend Alejandro told me about a big fish he hooked in Sylvan Lake that snapped his line, so I decided to go with him to try the muddy creek again. Read here for the last Sylvan Lake adventure. It turns out Sylvan lake was not dead, as I thought it was. It turns out I was just fishing in the wrong place. It was chock full of Green Sunfish, Pumpkinseeds, and Bluegill, but mostly greens. We must have 20-30 Greens apiece in the creek. 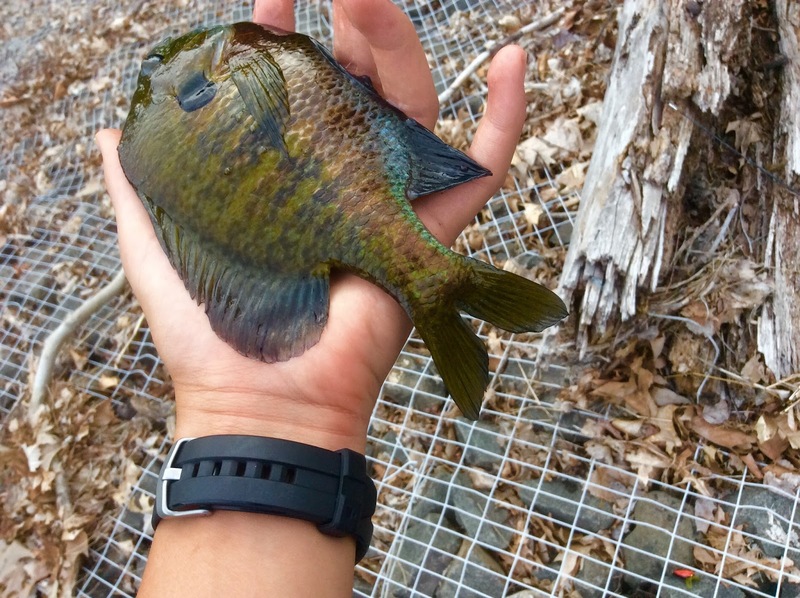 I also managed to snag a pumpkinseed on the belly... What was up with that? 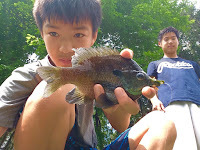 Bluegills were present as well. 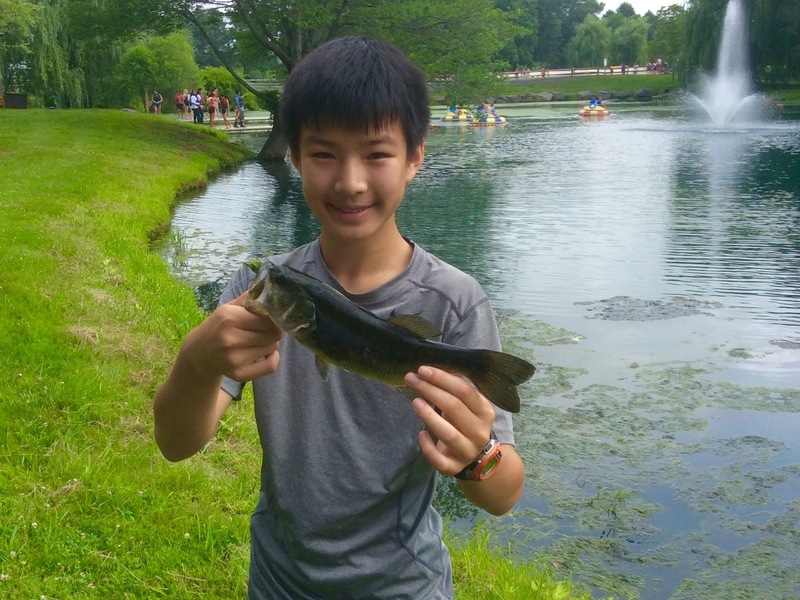 The biggest success of the day was seeing some mystery fish swimming around. For a fish to be a mystery in freshwater NJ is pretty hard to do. They were long, skinny, and 10-15 inches long. Their dorsal fin placement, there light brown color, their forked tail, as well as rounded head, made me think sucker, but their fins were black-tipped and they showed some interest in the spinners that I through at them, one of them even nipping it. It was strange, and may warrant a couple trips in the future to try to figure it out. Yay!!! 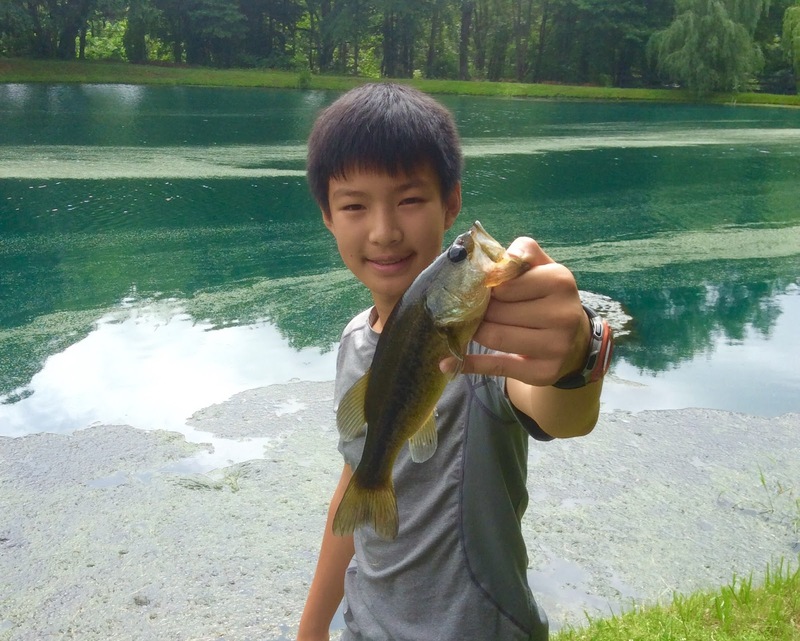 Another field trip with a chance to fish!!! We were going to Frogbridge Day Camp, for 5 hours of doing whatever we wanted to. I started out with fishing, but only for about an hour. My buddies James, Mike, Steve, and a bunch of others were there as well. The lake there has a turquoise tone, and it looks almost fake. There are, however a huge population of (stunted?) 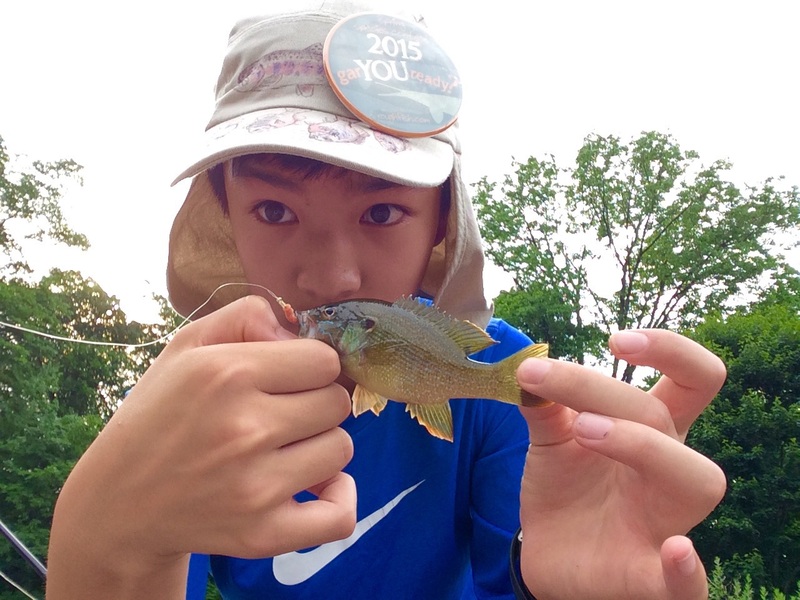 1-2 lb largemouths, some trophy bluegills,and some pumpkinseeds mixed in. There is literally no pressure on this lake, and I was pulling bass out of there within seconds. 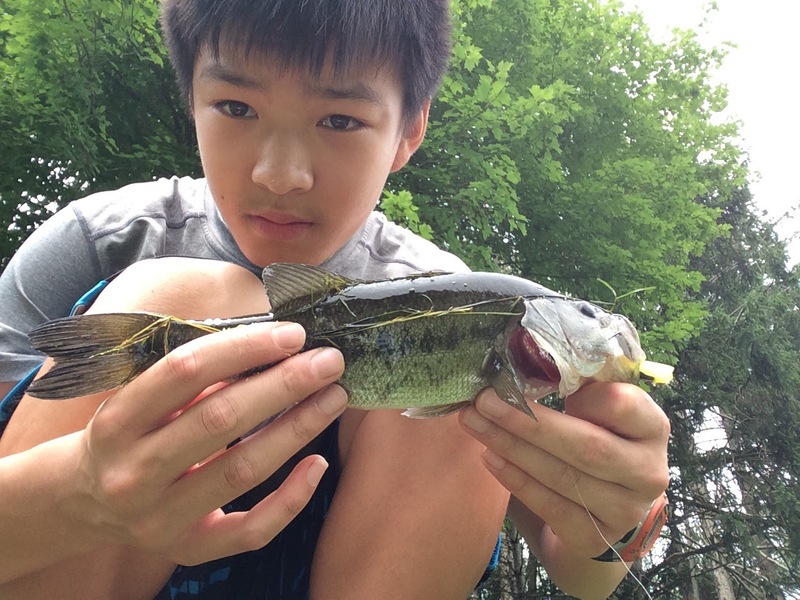 Most were small, but this was a decent NJ Largemouth. In an hour, I landed 9 bass and hooked many others. 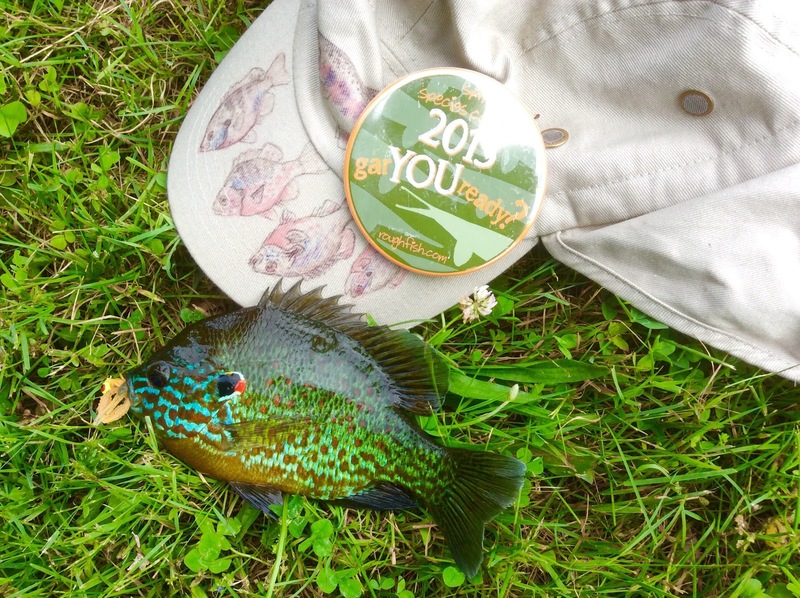 I also got 3 bonus bluegill and... finally... a pumpkinseed for the contest!!! not a bad one, either. It was fun, because it was sitting in a an opening in the grass mat in just a foot and a half of water. Sight fishing it and watching it nail my crawfish jig was pretty fun. 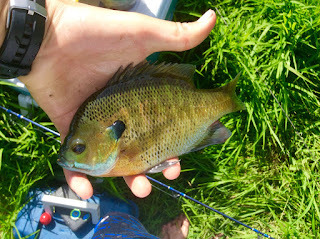 I went yet again this Sunday, back to the wonderful yet infamous sucker spot with three particular targets in mind: The Pumpkinseed, Rock Bass, and White Sucker. Rock Bass was first target, and I put on a jig and soft plastic and began casting. Second cast, a rock bass flies in and just slams the jig with absolute fury. 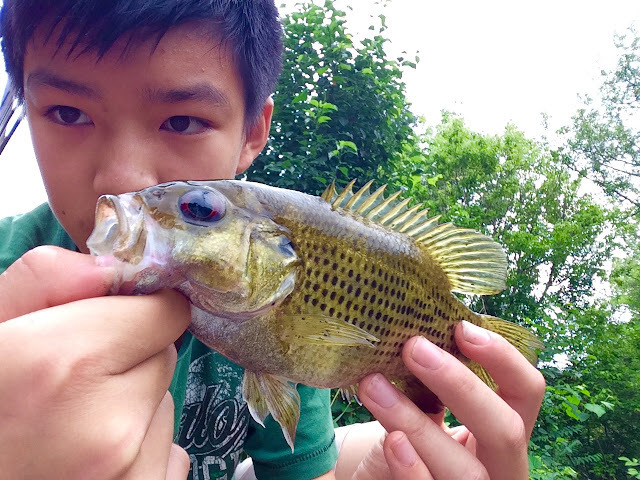 The technique I found out was to use baits larger than the bluegills can take. 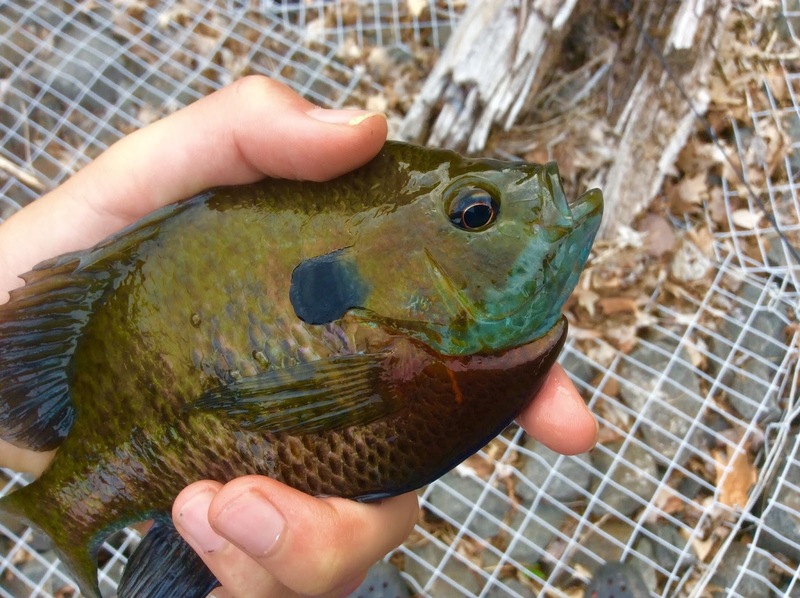 The stream is infested with 4-6 inch little gills, and they are the most aggressive fish I've ever seen, aside from one massive school of 100+ creek chubs. The jig I used was around 3 inches long, with a 1/4 ounce jighead. 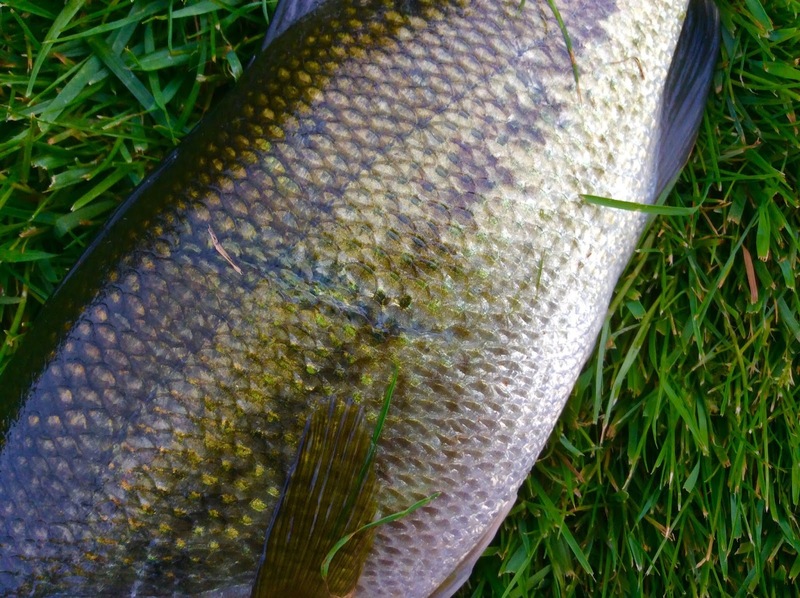 Rock basses' mouths in proportion to their body are similar to smallmouth bass, so they had no problem inhaling he lure. Rockies have been promoted to one of my many favorite fish. They are beautiful and I've heard they're absolutely delicious. 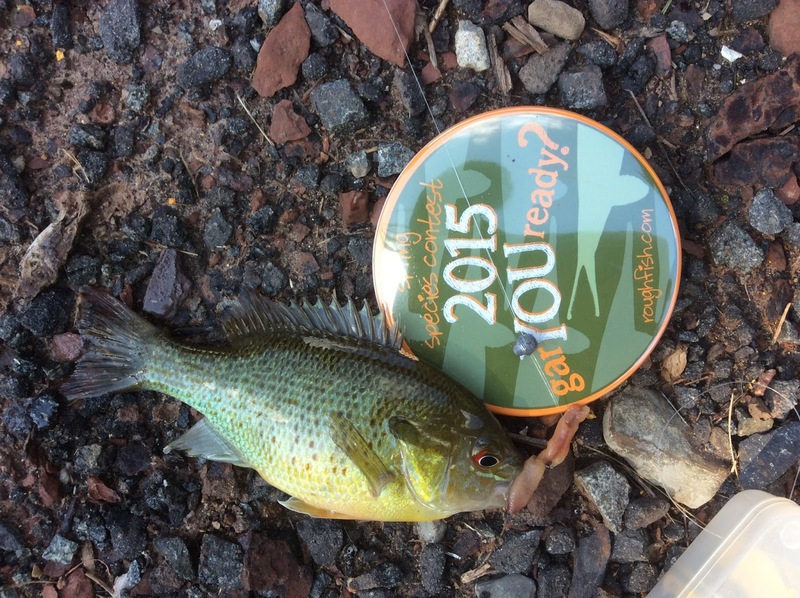 These fish would've been perfect pan-size, but I'm a CPR (Catch-Photo-Release) guy. 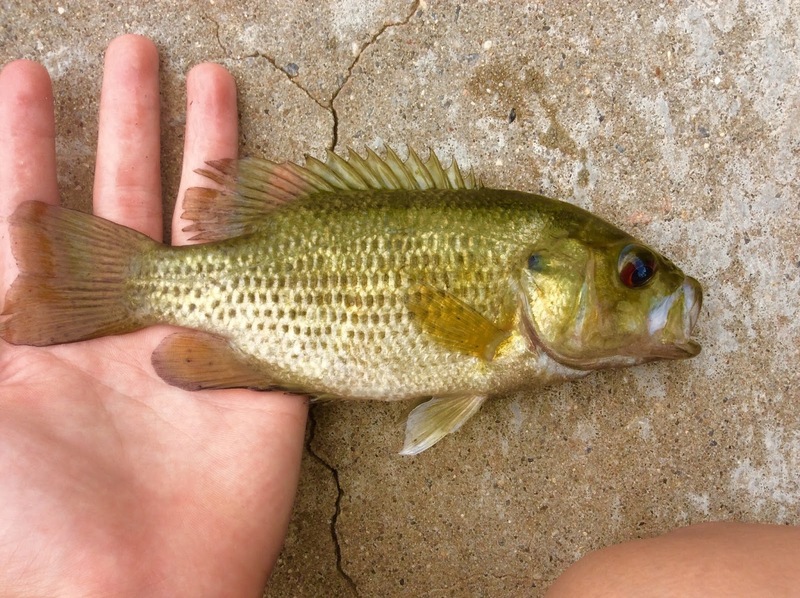 Talking about Rock Bass qualities, these things fight like banshees on steroids. Their battle is equivalent, if not better than a largemouth three times their size. Man, these rockies sure are pretty. Check out that bronze coloration and blood-red eyes! Somewhere in between the Rock Bass, I changed out to a worm, and landed hordes of barbarian bluegills and redbreasts, plus one yellow bullhead that I was really hoping to be a brown. The suckers had apparently traveled to whatever other parallel dimension they live in. Only got a few glimpses of some today. Pumpkinseeds, a usually plentiful and gluttonous species, continue to shun me throughout the month of June. I set out to nearby Sylvan Lake in search of carp, where my friend James said he caught some. Well, long story short, the place was dead. The entire lake had recently been drained, and it was real shallow. There might have been some carp towards the middle f the lake where it was slightly deeper, but I couldn't get there, because the lake bottom was entirely silt and mud. I sank down to my thighs in some places, the I had to take my feet out, then reach in and grab my shoes. The upside, however, is that I found a rocky area where the lake dumps into the creek that had plenty of micros. 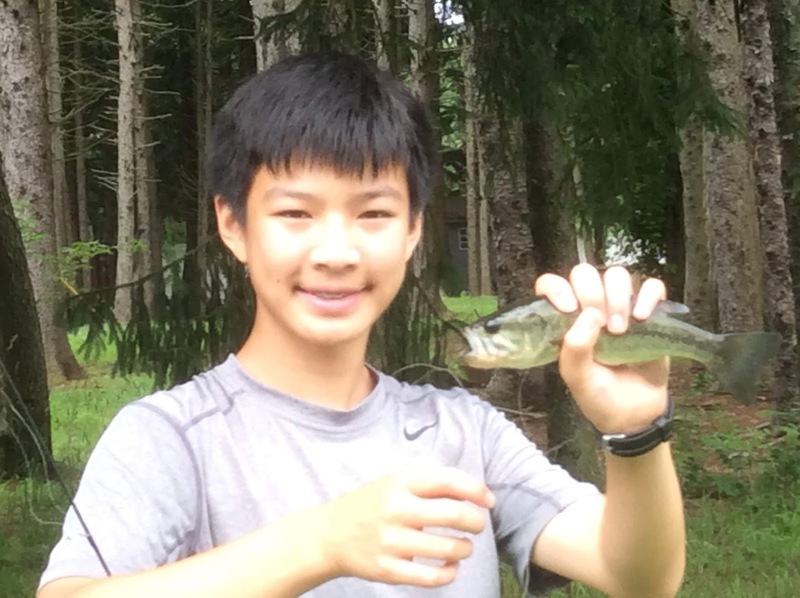 There was multiple species, but I only managed to catch one specimen of one species in the 2 hours that I fished. The majority of them ignored the bait and were spooked so I couldn't reach them with my 7 ft cane pole. 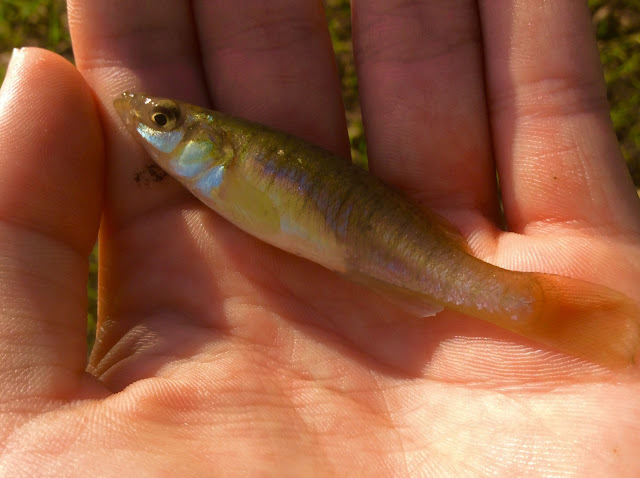 The one species, however, was a Banded Killifish, and a trophy one at that! 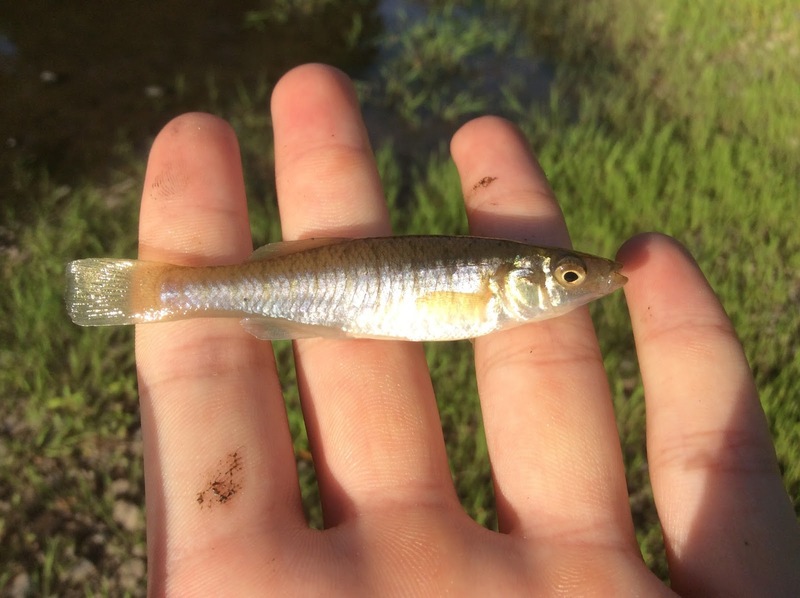 Okay, trophy may not be the best choice of words, but from what I saw, this was a beast of an Banded Killifish! There you have it, folks! 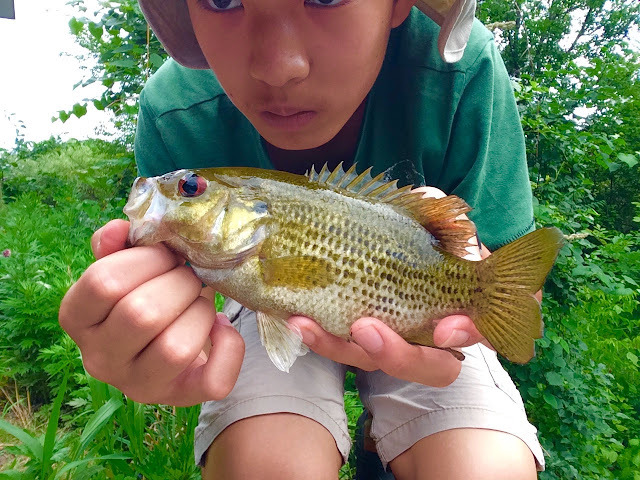 Species #44 and a check of the NJ species list! 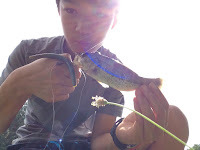 It's the second contest outing, and I was looking for a pumpkinseed and largemouth bass in the pond. First I looked in the creek. 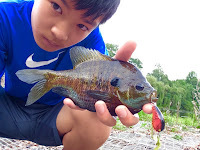 There's sometimes pumpkinseeds there. 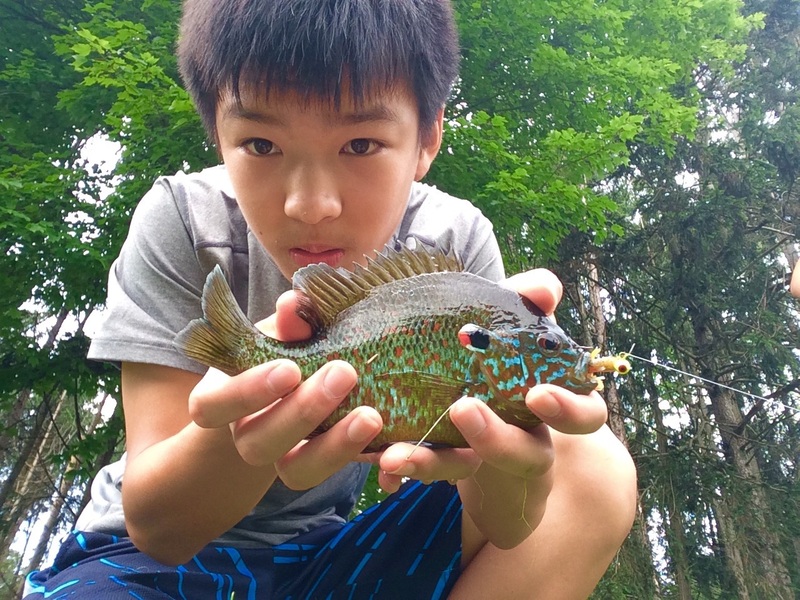 After a few runt bluegills, I pulled p a surprise fish... A green sunfish! 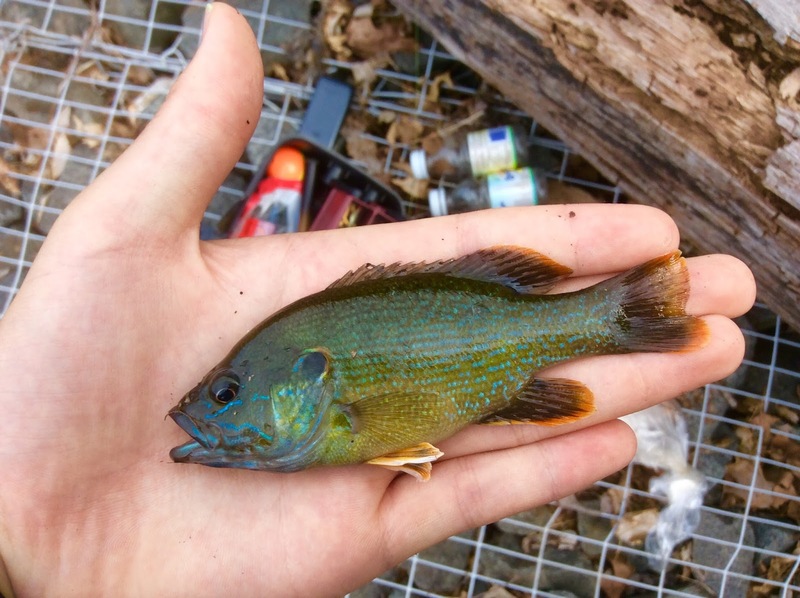 Green Sunnies are an invasive species in NJ, and not to common. This was my first one in 2015. And a beaut, too. Look at that electric blue and orange! Well, I got another contest entry! 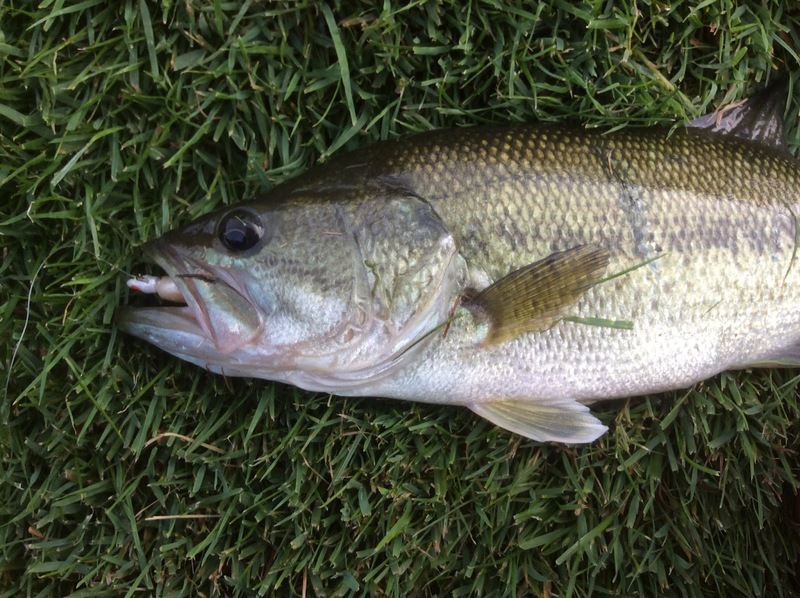 After that, I switched my attention to largemouths and I got plenty. 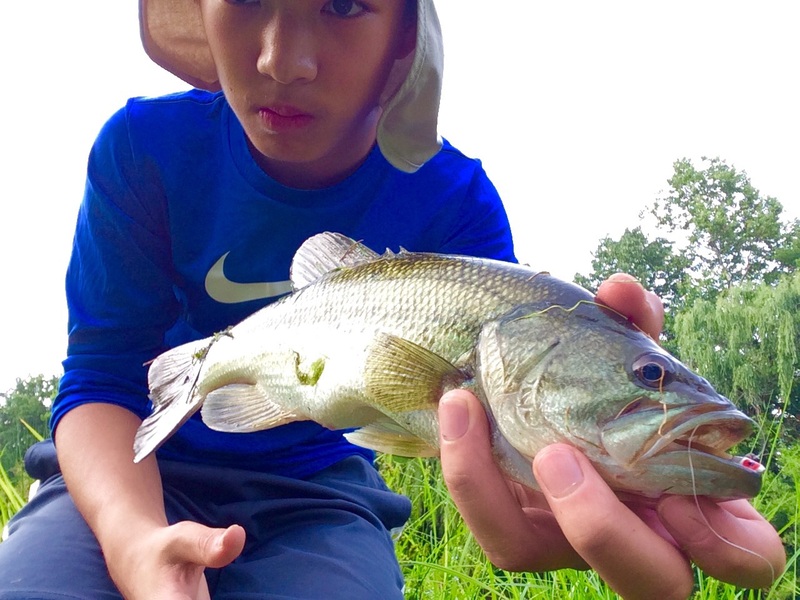 None of decent size, but fun nonetheless. 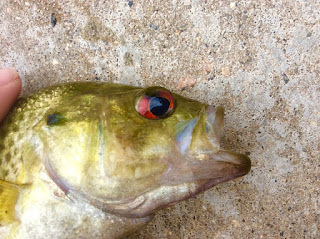 This fish had a healed but definite scar on him... maybe a much bigger bass attacked him? 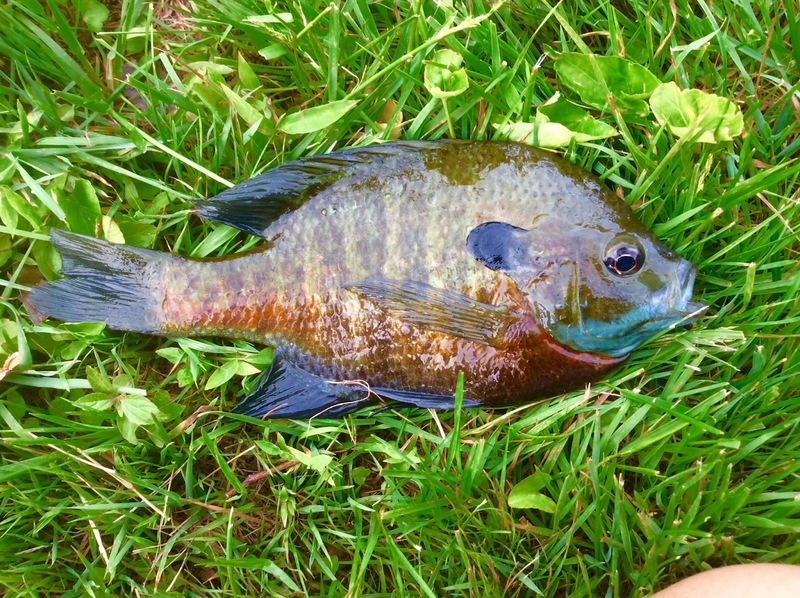 The post spawn gills were also hungry... Nice and dark-colored too. They were really skinny, and all had spawning wear, like split tails. I managed to sneak away last Sunday for the first contest outing! Roughfish.com hosts a June species contest, in which the winner gets a custom rod. There is 0% chance that I will win, but it's great to see how much species I can get in a month! 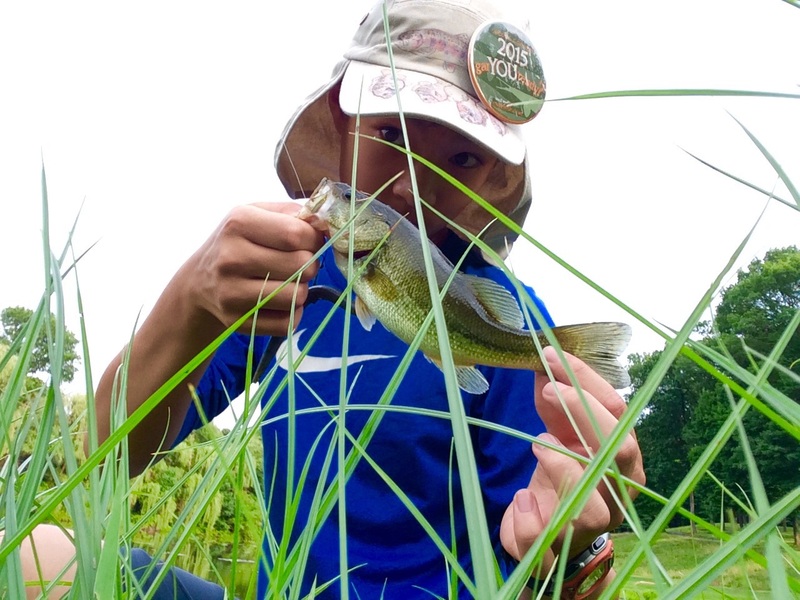 I haven't been doing much fishing lately, due to life's constant changes, but hopefully, I'll get back on the water as the summer progresses! 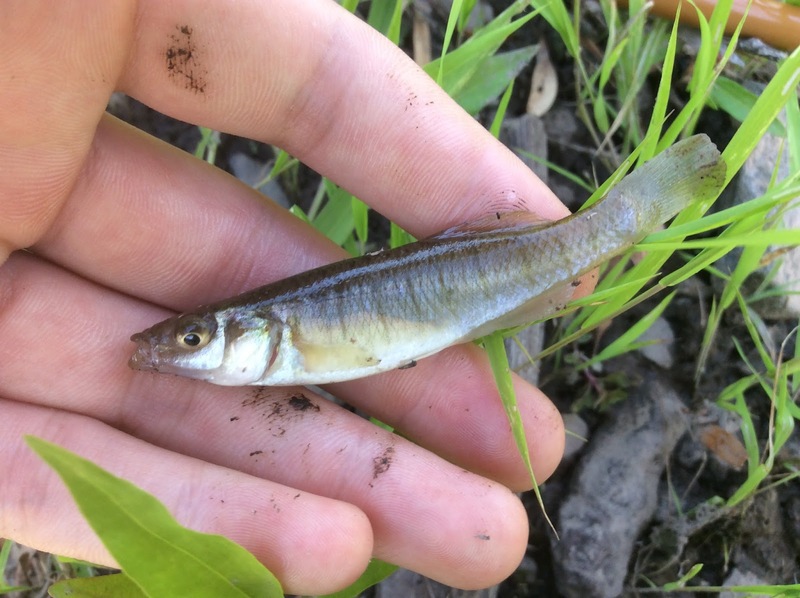 I went to my local creek where I caught the suckers, to find as many species as possible. 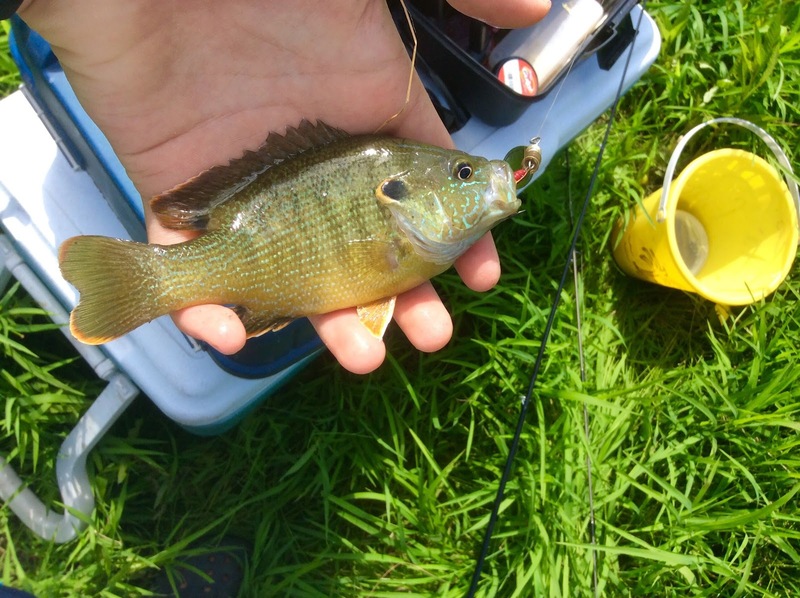 In quick succession, I caught a bluegill (#1) and redbreast sunfish (#2). I tried for suckers, but they weren't taking anything. The gaxillions (10^ (3x10^(3x10^3decillion) +3) of sunfish would swarm the bait as soon as it hit the water. 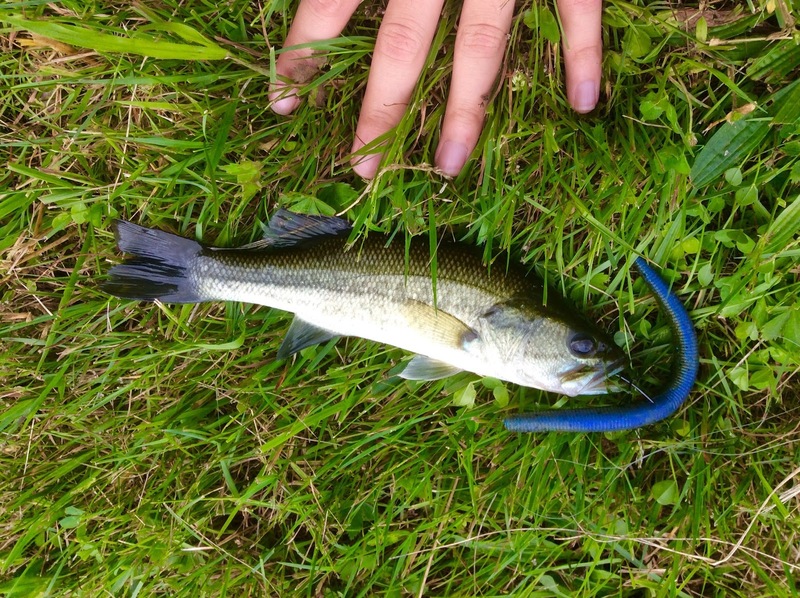 I did manage to place the worm DIRECTLY under a sucker's snout, but it wouldn't commit. 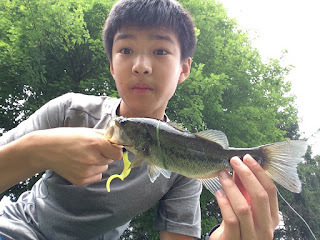 If I managed to place the worm ASAP within a centimeter of the sucker's head, the sunnies would look at it, and back off. No suckers for me today, though. 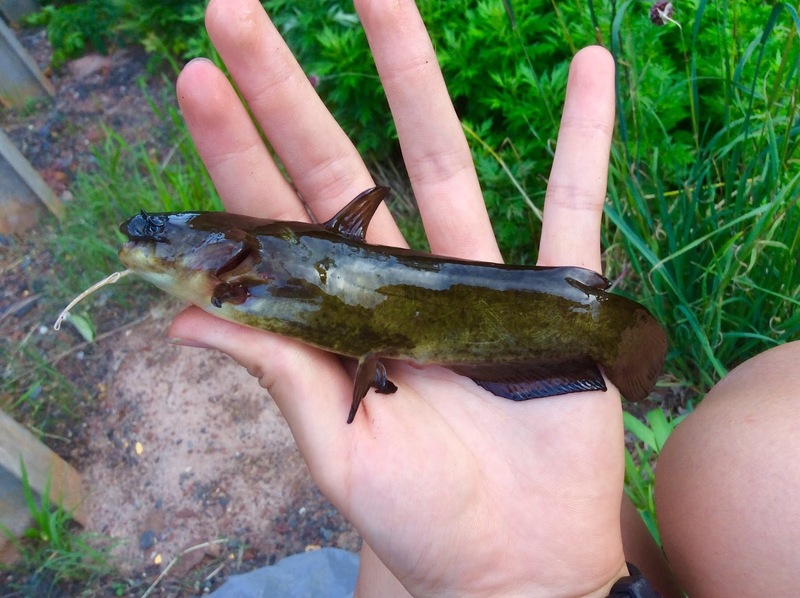 Later, I caught a yellow bullhead (#3) with nice mottling and called it a day. And this snapper. Can you see him? He was +35 lbs.